They are still with body and soul at it, more than ever worrying about global politics, especially in their home country, the USA. After it had released its latest album in December 2017, Leviathan, the band played several shows and has been practicing for these at The Magpie Cage Recording Studio. The rehearsals also resulted in the recording of two further songs – one new track and one cover song. 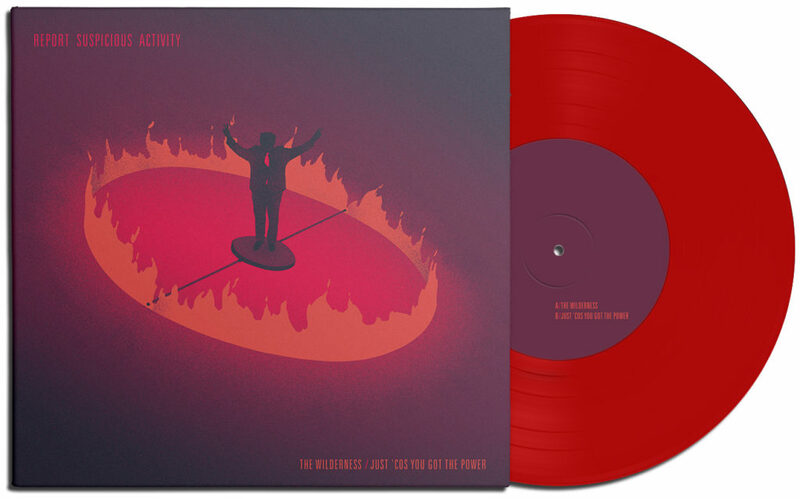 Both have now been released on an exclusive 7″, as a limited pressing of 300 copies on red vinyl, and digitally. The Wilderness is the site of an American Civil War battle, near Fredericksburg, Virginia. It is also the title of this new 7″ from REPORT SUSPICIOUS ACTIVITY, the Baltimore band that includes Vic Bondi (Articles of Faith, Alloy, Dead Ending), J Robbins (Jawbox, Burning Airlines) as well as Erik Denno and Darren Zentek (both Kerosene 454 and Oswego). The battle of the Wilderness was famous for being fought in dense underbrush that caught fire and consumed both sides. The single is incendiary and relentless. Backed with a very special cover version of Motörhead‘s Just ‘Cos You Got the Power. Get your copy now at the Arctic Rodeo webstore worldwide or at the Stickfigure Mailorder in the US. ‹ SECOND LETTER – new album “Cicatrix” out today!